Redhopper is an open source Redmine plugin that allows creating Kanban boards for Redmine. It was inspired by Jira Agile (formerly known as Greenhopper), but follows its own path. Redhopper makes an extensive use of Redmine core concepts (issues, trackers, workflow, etc.) instead of building everything from scratch. No need to define columns, your issue statuses are good enough. No need to define allowed transitions, your workflow already does it. Get a useful board in seconds. The Redmine Agile Plugin is a commercial Redmine board for agile management. There are sprints, backlogs, charts and swim-lanes. First, the sprint backlog is created from the project backlog and then, during stand-up meetings, tasks are moved on the board using a drag & drop feature. Managers then monitor sprint progress in the charts. The development of the original Redmine Backlogs has stopped, but there are a number of forks that are still actively maintained to be compatible with the last Redmine version. * Sprint task board with drag & drop. * Product backlog with drag & drop. * Product backlog burndown chart. * Edit PBIs & tasks with a pop-up directly in PB or Sprint board. * General Scrum stats for project. * Hints to use the plugin when something is not well configured. * Easy to setup, plugin settings & configuration per project. * Several new permissions in Administration section. 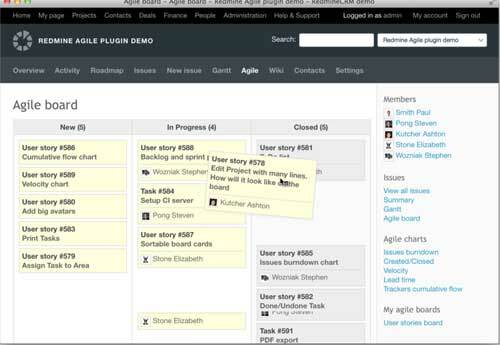 Easy Agile is a simple task board that allows you to define stories and track their statuses through iteration. The application is quite straightforward for the people familiar with the SCRUM and Agile methodology. Redmine-Scrumbler is a Redmine plugin that allows to use the Scrum/Agile process in projects. Scrumbler have interactive dashboard with the ability to configure for each sprint. Plugin adds Scrum Points field in every issue in project. Scrumbler as possible using the standard redmine structure of projects. Redmine Scrummer is a Redmine plugin to let it supports the Scrum and Agile approaches. Scrummer is a flexible project management web application written using Ruby on Rails framework. 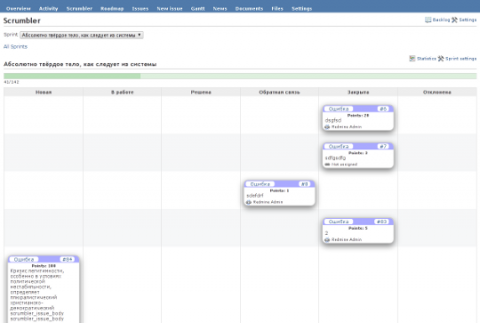 Scrum PM is a plugin for Redmine for Scrum project management. Redmine Version class becomes a sprint and issue becomes task. Most actions support drag and drop and in the dashboard you can change status of your task simply by dragging it to another column. * Support for UML diagram generators railroad (Rails) and umlgraph (JAVA). Version Burndown Charts Plugin create burndown chart graph for Scrum from ticket’s estimated hours and %Done in target version. Development stopped in 2010. A nested, easy to use project based todos plugin for Redmine. Allows easy creation and management of infinitely nestable todo lists on a per project basis, that can be organized into sprints(or releases). Also provides global ‘My Todos’ for all projects. Todos can be allocated to uses, and tied to Redmine Issues. Development stopped in 2009 “Scrumdashboard” is a plugin for Redmine. It enables Redmine to better support the Scrum process by giving the users access to a digital “dashboard”. This shows the status for the current sprint through a digital representation of a whiteboard with post-it notes detailing User Stories/Features/etc (from the product backlog) which is often used with projects using Scrum. Redmine Agile Plugin is NOT a Plugin for Redmine. The software is a complete own solution based on redmine.org code and offers a agile Plugin for that solution. Thanks for the mention (Scrum plugin)!